Like any other major home investment, ensuring you get the most out of your new garage door and garage door opener with proper, regular maintenance is not only fiscally responsible, it will also save you from the stress and frustration of dealing with a broken door in the future. There are a few simple maintenance tasks that can drastically improve the longevity of your door, check out our list here and save yourself money, time and frustration in the future and be sure to get every year possible out of your garage door. Opening and closing more than a thousand times a year can lead to some seriously jiggly bolts! The key ones to focus on are the bolts that hold the rails to the supports and the roller brackets. This can be easily done with a socket wrench and save your garage door system from unnecessary wear and tear. Avoid causing your opener to work harder than it has to. An unbalanced door is one of the quickest ways to ruin your garage door opener. Testing the balance or your door is simple. Start by placing your door in manual mode by pulling the emergency release cord. Then open the door to about half way and let it go. If it doesn't stay where you leave it, the counterweight, or torsion spring, system is improperly balanced and you should give your garage door technician a call. Any work done with the spring should always be handled by a pro. Probably one of the most commonly overlooked maintenance tasks for your garage door. Maintaining your garage doors finish is vital for preventing rust, warping or cracking as well as keeping it aesthetically pleasing. Regardless of the material your door is made of, there are steps to take to ensure it holds up over the years. Painted doors will need to be lightly sanded and repainted periodically and stained doors need to be touched up as well. Keeping up on these tasks will prevent unwanted moisture from penetrating the wood or rusting metal looking sharp! There are a lot of moving parts in your garage door, and when they are not properly lubricated they will cause unwanted friction and wear and tear to your door, decreasing its life expectancy. Use track lubrication recommended by your owner's manual and pay special attention to rollers, hinges and the spring. Establishing a relationship with your local garage door service techs is really the best tip to keeping your door running strong for years to come. Schedule yearly safety inspections and maintenance and be sure to call at the first sign of problems. 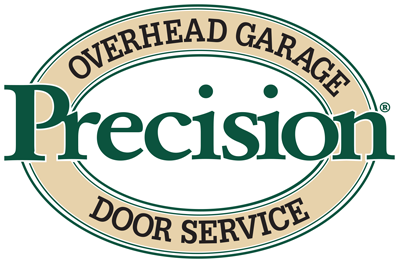 At Precision Door Service, we specialize in maintaining your garage door and would be more than happy to go over these tasks with you. Please feel free to give us a call anytime!